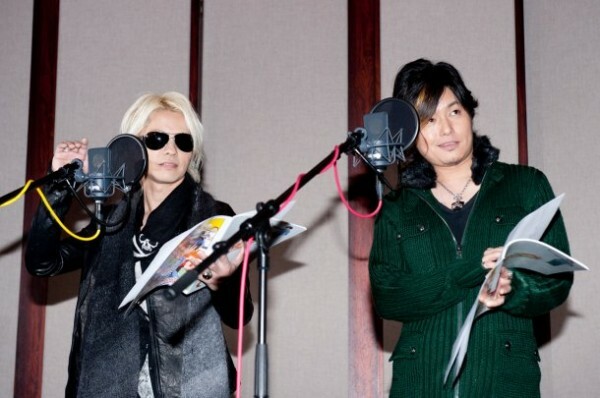 HYDE takes to voice acting for "Bakuman"
HYDE from popular rock unit, VAMPS recently participated in voice acting for the anime "Bakuman." This was his first time voice acting and he showed up at the recording on December 13th. �"Bakuman" is an ongoing manga on "Weekly Shonen Jump", and it's a story of boys who are trying to be manga-ka. HYDE will play as "HYDE," a producer of "KOOGY" (Morikubo Shotaro) who is a musician and Manga-ka. �In the anime, KOOGY sings "GET UP" which is from VAMPS' 2nd album "BEAST". �(Original song is in English, but HYDE translated it to Japanese for "KOOGY".) �The "GET UP" Japanese version will be self-covered by HYDE, and will be included in VAMPS' upcoming single "MEMORIES" set to be released on December 15th. � The date of broadcast for the episode in which "HYDE" makes an appearance will be announced on the January 17th edition of "Weekly Shonen Jump." Sakai Masaaki & Fujiwara Norika to host "Japan Record Awards"